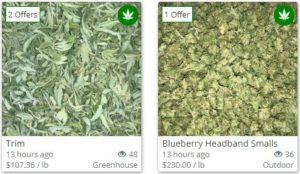 Since Croptober the California marketplace has seen a major uptick in activity from users who are listing their products. The market is saturated with bud and if you want to move units, you’ll need to think about how to stand out. The most obvious way to make sure you get eyes on your product would be to post great photos. If a user is interested in your product and there are no photos posted, the first thing they will ask for is an image of what they’re getting. Clear photos with glistening trichomes would be best but any kind of visual representation of your product is essential. Show buyers what they want to see and you will not only cut down the time it takes to make a sale, but you’ll draw bigger offers as well. Okay, now that we know what your bud looks like let’s consider that your buyer will also be interested to see a COA. A certificate of analysis can show that your product is void of any pesticides that could cause problems for them down the line. Beyond that you can highlight the value of your product if you have something that is particularly potent or diverse in terms of Cannabinoids. If you want to go the extra mile, you should have your product tested through a distributor with a State-Certified final COA. Per SB-311 your final COA is transferable if it is moved from distributor to distributor, a huge plus in a when a considerable portion of the market fails standards. Beyond that there are still ways to add value to your product and appeal to specific desires. Take a read through some wanted ads on the platform. While you will find benchmarks for extraction material, you’ll notice that there is demand out there for specs that don’t have to do with THC content. Whether you have a particularly fruity strain or a phenotype that is unique and coveted, the smallest detail could make the difference between your product and the next.